I never imagined that I would be making, let alone eating and enjoying Tofu Pad Thai. In fact, if you asked me just a few years back, if I would eat tofu, I would have told you that you were crazy. I was a chicken and beef eater and saw no need for a meat replacement. 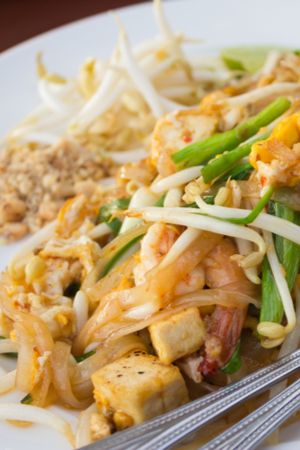 Mouth watering Tofu Pad Thai topped with bean sprouts, peanuts and green onions. However, things change. In my quest to explore various food cultures and options, I have opened up to trying new things. My first bite of tofu was about 8 years ago. My brother lives a vegan lifestyle and I went to visit for an extended weekend. That means in his house he has absolutely no animal products. Not only in the kitchen, but in the entire household. During my visit I was introduced to a lot of food combinations that I would not typically make or eat. And I have to say, I was pleasantly surprised! After draining, press the tofu to release more moisture. Alfredo pasta, tater-tot casserole, and of course Tofu Pad Thai. I honestly have to say that I felt like I was eating ‘real’ cheese when I ate the Alfredo pasta and chicken when I was eating the Tofu Pad Thai. This recipe works best with firm to extra-firm organic tofu. Just drain the tofu and press out the excess liquid. Tofu pieces marinating before being air fried. If you don’t have a tofu press, no worries. Just place a stack of 6 paper towels on a plate, then add the tofu. Put another 6 paper towels on top and weigh it down by placing a heavy object on top. Sometimes I use a cast iron skillet, but almost anything will work. This time I placed a cutting board on top with my knife set on top of that for the weight. Then it was time to cut and cook the tofu. Instead of frying it in the skillet I decided to use my BCP 5.5 quart air fryer. 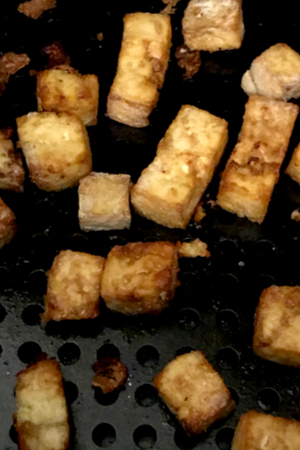 Crispy tofu cooked in the air fryer. It requires less oil and provides a nice crispy product in just 10 minutes. That allowed me to boil the water for the rice noodles and heat the skillet for the vegetables on the stove. The tofu was drizzled with coconut aminos and tossed in a little cornstarch. If you don’t have coconut aminos, lite soy sauce would work. Then 10 minutes in the air fryer and you have nice and crispy tofu ready to be tossed in a pad Thai sauce. 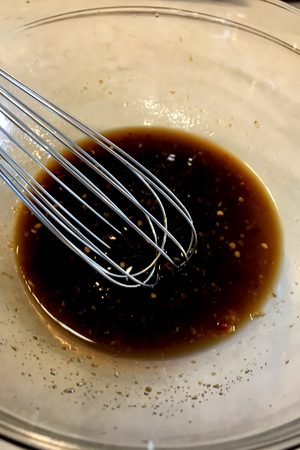 Of course you could purchase a bottle of pad Thai sauce, but it is so easy to make your own delicious sauce at home. Plus you can adapt the flavor and heat level to your preference. A little soy sauce (or coconut aminos), brown sugar, sweet chili sauce, garlic and lime juice is all that is required. For those that enjoy the taste of fish sauce, you could add that in as well. But for those who are vegan or who have a strong dislike to fish sauce, the pad Thai sauce is amazing without it. When ordering pad Thai at your favorite restaurant it will most likely come with a scrambled egg incorporated in the dish. Pad Thai rice noodles being tossed and coated along with the tofu and veggies. Of course, if you are vegan or if you have an egg allergy, it is easy to omit the egg. 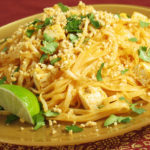 However, if you are making this tofu pad Thai recipe at home, you can certainly add the egg in if you prefer. Once the peppers and onions are almost tender, scoot them to one side of your hot skillet. Crack open the egg on the other side of the skillet and mix it until scrambled. All there is left to do is to add in the sauce, tofu and cooked rice noodles! 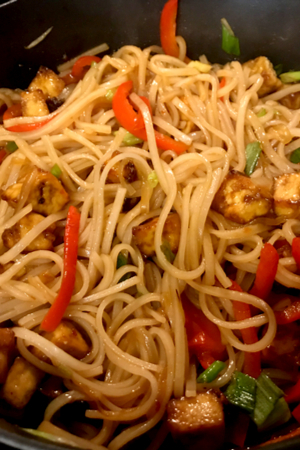 Classic Pad Thai recipe with protein packed tofu cooked in the air fryer and mixed in a sweet heat chili sauce with rice noodles. 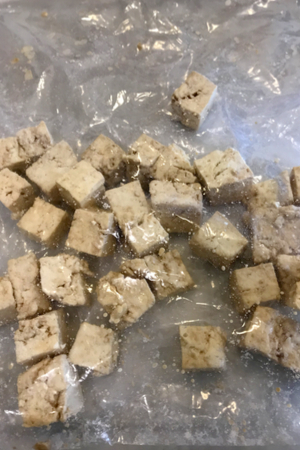 Remove tofu from the package and drain. Line a plate with 6 stacked paper towels. Place the tofu on the paper towels. Add a stack of 6 more paper towels on top of the tofu. Place another plate and heavy object on top of the plate. Let the tofu drain for at least 10 minutes. 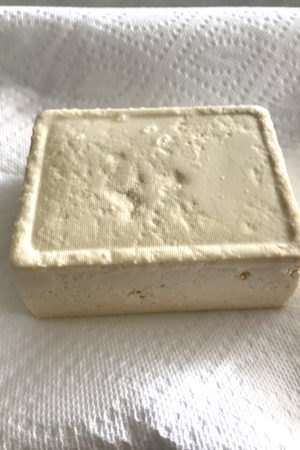 Once Tofu has drained, cut it in ½ inch squares. Place the pieces in a gallon plastic bag and drizzle in 1 tablespoon of coconut aminos. Shake well to coat all the pieces. To the bag, add in 1 tablespoon corn starch. Shake well to coat. Let sit for at least 10 minutes. While you wait slice the red pepper, onion, peanuts and green onions and set aside. Preheat air fryer at 390 degrees F. Spray the tofu with grapeseed oil and place in the basket of the air fryer, working in batches if necessary. Cook at 390 for 10 minutes, shaking the basket half way through. Once cooked, set aside. In a large stockpot, bring 4 quarts of water to a boil. Once at a boil place pad Thai rice noodles in the water, remove it from the heat, and let it sit for 8-10 minutes. Drain and rinse in cold water and set aside. In a bowl whisk together the soy sauce, brown sugar, sweet chili sauce, garlic, red pepper flakes and lime juice, set aside. In a large skillet over medium-high heat, add olive oil. Once hot add red pepper and onion slices. Heat until tender (approximately 5-7 minutes). Add the sauce, tofu and noodles and heat through and toss to coat the noodles and tofu. Serve and top with bean sprouts, peanuts and green onions. If you prefer to add egg to your Pad Thai dish, do so as the peppers and onions are sautéing.